Lemon, the makers of a mobile wallet application for iPhone and Android, is today launching its developer platform, cleverly called “Lemonade.” The “ADE” stands for “Application Development Engine,” and it represents the first initiative from the company to open up its platform to third-party developers. With Lemon’s new API, app developers, merchants and brands will be able to use the wallet platform to better connect with customers by offering their own interactive cards for installation. Lemonade is available both a website and in-app feature where consumers can browse and install “smart cards,” as these new, third-party developed cards are being called. With today’s launch, there are only a dozen some cards available from smaller developers, but Lemon CEO Wences Casares tells us that a series of big-name launch partners will be making their debut in about a month. The forthcoming partners will include gift card providers, brands, merchants and credit card companies – the latter which will actually allow Lemon users to shop for credit cards from within the app. In addition to making their smart cards available to new customers, the card providers will also be able to see how many consumers already have their cards installed, and will be able to then use the platform to interact with those users. 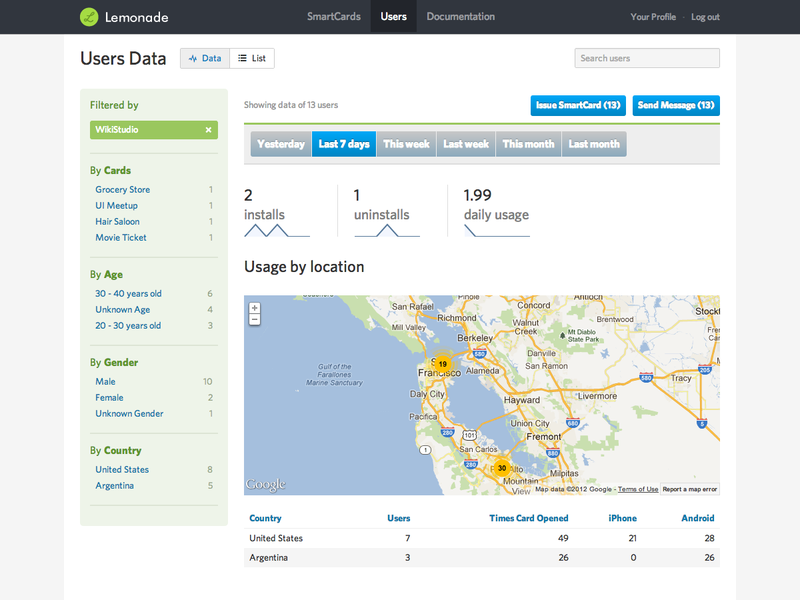 The Lemonade developer dashboard provides anonymous user data showing user demographics, spending habits and redemption analytics, so card providers can better understand customer behavior, segmented by country, currency, favored merchants, age, gender and purchase categories. Using the SmartCard Wizard, developers can customize their cards in terms of design as well as functionality. Developers can control what the card looks like when it appears in Lemon’s wallet interface – for example, a credit card could be gold or platinum, or it could display a user’s credit score in green, yellow or red. A gift card could display the current balance, which is updated as the money is spent. Cards can also be used as mechanisms to allow the card providers to communicate with users, letting users send messages, respond to surveys, receive offers, discounts, and more. Other card add-ons might include integrated loyalty programs, coupon tracking tools, or price comparison tools. Support for tickets is also possible, and these can now be made interactive as well, alerting users to venue or time changes for the event, among other things. Previously, the only way users could add cards to their Lemon wallet was to take a picture of those items using their smartphone’s camera. Lemon would then do some OCR image processing to enrich the card, and store it as a digital version on the user’s phone. But this functionality also means that Lemon is not limited in terms of the type of cards it can house. Like a real wallet, users can store payment cards, gift cards, loyalty cards, insurance cards, coupons, driver’s license and ID cards, receipts, and more within Lemon’s mobile wallet interface. In July, the company expanded on this to introduce a business-grade offering that lets users submit receipts directly to their employer for reimbursement via Lemon. Because of its ability to fully replicate the functionality of a real wallet, Lemon doesn’t see itself as competitor to Apple’s new Passbook app, but rather a more fully-featured wallet complement. “We see Passbook as a very important operating system feature, like push notifications,” explains Casares. “Today, it would be very hard to imagine a mobile operating system without push notifications. I think one day it will be hard to imagine an operating system that doesn’t have a Passbook-like feature…but it’s not really a place where you go and manage these services,” he adds. That’s where Lemon comes in. Casares also tells us that Lemon’s Passbook integration, which will serve the 70% of Lemon’s users on iOS (or, at least, the subset of those who upgraded to iOS 6), is still about two months out. Lemon now has over 2 million users who store an average of 5 cards, 2 of which are payment cards, within its application. And these users return once per week on average. While today’s developer API will be made available for free, the company has other plans to monetize, including the debut of a Pro plan which now lets users cancel all their cards with one click, in the case of a lost or stolen wallet, for example. The Lemonade platform is available now at www.lemon.com/platform. The company is also running a developer contest with cash prizes to encourage the developer community to begin work on wallet integrations.